'Extrasolar cartography' technique could provide rough pictures of alien worlds. 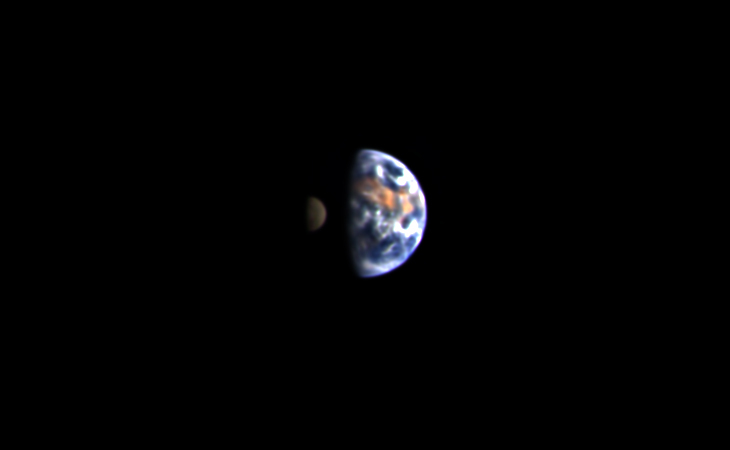 This EPOXI mission image shows what an Earth-like exoplanet might look like from afar. (ISNS) -- Astronomers could one day create rough maps of far-away planets using information taken from starlight reflection, determining the balance of oceans, lands and overhanging clouds. The software can take a point of reflected starlight from an exoplanet to tease apart the unique signals required to form a rough map. Developed by planetary scientist Nicolas Cowan and presented this month at a meeting of the American Astronomical Society in Long Beach, Calif., it is inspired by a technique originally developed to distinguish between natural surfaces – such as forests – and unnatural ones like military bunkers in satellite images of Earth. Because there is currently no telescope powerful enough to directly photograph a faraway rocky planet, Cowan tested the software on images of Earth taken from a distant vantage point in space by NASA's Deep Impact spacecraft as part of the EPOXI mission. "The object of this experiment was to see whether we could identify the colors of surfaces on Earth, [and tell] how many major surfaces are there, and what they look like," said Cowan, who works at Northwestern University in Evanston, Ill.
Cowan's technique – called "rotational unmixing" – analyzes the changing color of starlight reflecting off a distant, spinning exoplanet to calculate the mix of planetary features – such as land or ocean – that might combine to create a specific hue. The technique is similar to being in an otherwise dark room with a muted television and analyzing the light reflected on the opposite wall to figure what is playing on the TV. "You're not seeing the picture, but you're seeing the reflection of the picture and learning something about what's going on there," said Eric Ford, an astronomer at the University of Florida in Gainesville, who was not involved in the study. When Cowan's software was applied to EPOXI images of Earth, it was able to extract reflectance signatures corresponding to three major surface types. "The analysis told us there were three important features," Cowan said, "and their spectra look an awful lot like land, ocean, and clouds." Lisa Kaltenegger, an exoplanet researcher at the Max-Planck Institute for Astronomy in Heidelberg, Germany, said Cowan's technique was very interesting– but with a few caveats. For example, the exoplanet must have highly contrasting surfaces, such as ocean and land, or ocean and clouds, for this technique to work well. "If you have an ocean planet or a planet that is all land, it would be very challenging because you don't have different surfaces," said Kaltenegger, who also did not participate in the study. Another challenge would be distinguishing between clouds and ice on a planet's surface, according to Aomawa Shields, an astrobiologist at the University of Washington in Seattle who was not involved in the study. "Being able to tell whether a planet is simply undergoing significant cloud cover, or is in the midst of a global glaciation is important from the standpoint of habitability," Shields said. If the right planet could be found, however, the rotational unmixing technique could give astronomers a rough idea of the ocean-to-land ratio of an exoplanet, or provide a sense of what the climate is like by analyzing cloud cover and cloud movement. The resulting picture would not be a map in the traditional sense. "It's not like a map that you can use to land a spacecraft on a planet ... but it's better than nothing," Cowan said. Before astronomers can apply the technique to a real exoplanet, they will first need a telescope with a lens that is not only big enough to resolve the pinprick of reflected light from a distant world, but powerful enough to extract meaningful data from short-period observations lasting only hours – the time it takes for an Earth-like planet to make a complete turn. "You need a next-gen telescope," Cowan said. "We're talking like early 2020s realistically." The task could be simplified if a target exoplanet rotated slower than Earth, or if it was located relatively close to us, so that it appeared bigger than it would otherwise. Fortunately, recent discoveries by NASA's Kepler mission suggest the galaxy is teeming with planets. Astronomers estimate the Milky Way contains at least 100 billion planets, and that at least 1-in-17 sunlike stars have Earth-sized, rocky worlds circling around them. "The good news is it's not like we're going to have to look halfway across the galaxy to find some cool planets to study," Ford said. Ker Than is a freelance writer based in Southern California.